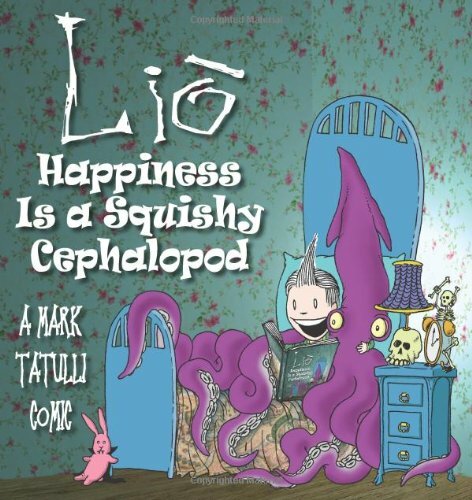 Order ‘Lio: Happiness Is a Squishy Cephalopod’ by Mark Tatulli from Amazon.com by clicking on the book cover above! “LIO” is the creation of Mark Tatulli, and he’s a fresh brand of weird and wonderful now appearing in more than 250 newspapers, with more adding the strip daily. If Far Side creator Gary Larson and “Calvin” creator Bill Watterson had mated, LIO is the character they would have produced. Tatulli’s brainchild, LIO, and that’s spelled L-I-O, is a young boy who combines elements of mad scientist, comic strips, science fiction, and the Adams family, and get this, LIO never speaks. BOB ANDELMAN/Mr. MEDIA: Has LIO ever spoken in the strip? ANDELMAN: And he never will. TATULLI: I mean, others around him may speak, and he may get visitations from other comic strip characters, but he will never actually talk. 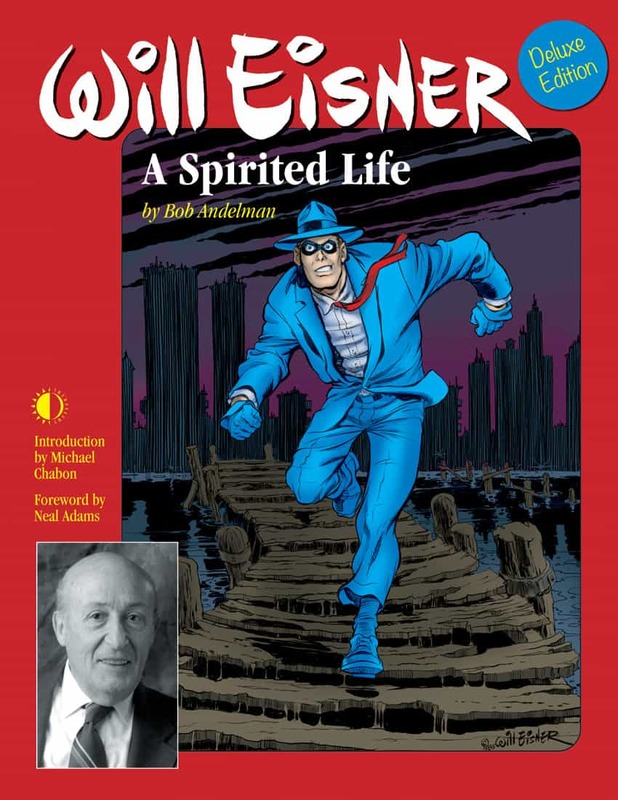 ANDELMAN: I was talking to a friend whose history of comics goes back even further than mine, and we both came to the same connection. We remembered a character called Henry. ANDELMAN: Is that close to “LIO”’s lineage in some way? TATULLI: Well, they are both pantomime strips, what’s called a pantomime strip, and those area basically strips that are driven by pictures in it instead of dialogue, so characters revealed by action rather than by words. I used to love pantomime strips when I was a kid. Henry is one, as you mentioned, and there was also Ferd’nand, which was, I believe that was not produced in the United States, but it did get circulation here. ANDELMAN: So Henry was certainly a strip that you were aware of. ANDELMAN: There really hasn’t been another one like that in some time. TATULLI: No, no, not since like the 1950s, and I just thought that with the space that they dial down to, that they actually allot to comic strips, I thought that it would be fun to do a comic strip that didn’t have any dialogue and any word balloons taking up any of that space, so I could utilize the entire space for illustration. It’s great fun on Sunday. ANDELMAN: Is LIO mute, or is it he just doesn’t speak in the strip? TATULLI: Yeah, he doesn’t speak, his father doesn’t speak, none of the characters really speak. Somebody might show up that you would expect to speak, like say Cathy from the “Cathy” comic strip or maybe Calvin and Hobbes or something like that, and you would expect them to speak because they speak within their world, but within LIO’s world, pretty much nobody speaks. There are sound effects, and there are billboards and so forth, but there is no actual dialogue. ANDELMAN: Have you ever in the time you have been doing this strip, have you had an idea, you woke up in the morning or in the middle of the night or you are in the shower, wherever you get your ideas, you had an idea for the strip that would have required him to say something, and then you went, oh, and you slap yourself on the head and go, ah, that’s right, he doesn’t talk, it’s not going to work? TATULLI: No, no, because I don’t think that way when I do these strips. It’s all visual, and so my brain is just switched in that mode. It’s odd, because I do have another comic strip called “Heart of the City,” and it is dialogue-driven or script-driven, and I hear their voices. I put them in situations, and I see how they react, and there is dialogue, but with LIO, because I don’t put any dialogue in, I just don’t hear a voice. ANDELMAN: It must require a tremendous amount of, oh, what’s the word I’m looking for, I mean, focus, to not want to slip and go to words, especially because you have the other strip where you are used to putting words in people’s mouths. TATULLI: Well, again, you know, I just don’t even think in terms of that. That’s not even an option. The other strip is dialogue-driven, and like I said, I hear the voices, but when it comes to “LIO,” I am just thinking visually, completely visually. ANDELMAN: What other rules have you set for this strip? What parameters are there? TATULLI: There are no parameters. TATULLI: It’s really a basic concept. It’s just LIO who lives with his father, and that’s basically it, and whatever I come up with. I set no parameters because I didn’t want to lock myself in. I mean, having no dialogue means that there is going to be no dialogue-driven gags, so I have to leave myself as open as possible to any kind of thing, so anything basically can happen. ANDELMAN: Mark, you mentioned that LIO lives with his father, and I wanted to ask you about that. Is there no mother? TATULLI: There is no mother, no. ANDELMAN: Is he a product of a broken home, or is it that Disney tradition of kids only have one parent? TATULLI: Well, I can’t imagine that a sane woman would stay in that environment for too long. Between the father and LIO, they are a couple of weirdos, so my guess is that she just about had it one day and just took off, but you know, it may make things simpler, because then there would be no dialogue between parents or anything. LIO’s father is kind of his guardian, more or less, and he just kind of goes with the flow. ANDELMAN: Now, we frequently see LIO’s father in fairly treacherous situations. How do you envision their relationship? Is he tolerant, or is he in fear of his son? TATULLI: Oh, he’s just tolerant. He just kind of goes with it. He just wants to, the interesting thing was that I had written the character of the father when I was out of work. I had lost my job, and I was feeling, you know, useless, and I kind of projected that onto this father character here, and he doesn’t really have a job. We never see him going off to work, and he just kind of sits around and watches TV and just kind of goes with the flow, and weird things happen, but, you know, he doesn’t ask too many questions, because I don’t think he really wants the answers. 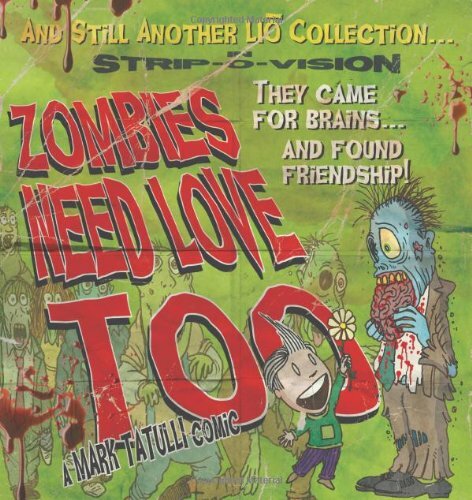 Order ‘Zombies Need Love Too: And Still Another Lio Collection’ by Mark Tatulli, available from Amazon.com by clicking on the book cover above! ANDELMAN: Now, what are some of the, in your mind, some of the strangest things that have happened between LIO and his father? TATULLI: Oh, my gosh. Every day is a new adventure, you know. They have been visited, well, I guess one of the strangest things would be that the father went into the refrigerator to get bacon and eggs, because he wanted to make bacon and eggs, and he found this enormous egg in the refrigerator and was very pleased about that, and the final panel is the egg has split open, and it was the alien from the Alien movie, the Ridley Scott movie, it wraps around his neck and was on his face, and LIO comes in and slaps his face, like, oh, my God, he’s getting in my experiments again. I would say that is among the most bizarre things, but those kinds of things happen every day, and everything is fine the next day. ANDELMAN: That’s the amazing thing. I love that. It’s just like there is a giant octopus or something, and LIO is so in command of his situation. What elements of personality does he take from his creator, and what kinds of things have you given him that would you like to have in your own personality, perhaps? TATULLI: Oh, geez. It’s mostly about fear. When you are a little kid, I was afraid of everything, because everything seemed so scary, and things that were even designed for kids seemed so scary. When you went and saw Sleeping Beauty, you know, the dragon in that was just really, really scary. Now to an adult taking the kids, oh, this is a lovely fairy tale I am taking my child to, and then you get there, and there’s this evil-looking queen, the most evil-looking queen you ever saw, and she turns into a dragon, and it just envelopes the screen, and it’s really, really horrific. Same thing with book illustrations. I remember being fascinated by Grimms’ Fairy Tales when I was a kid. Those stories are just downright sick, some of them. I remember, you know the story of Tom Thumb, but you don’t know that he actually is killed by a spider, and there was this illustration in this Grimms’ Fairy Tale of the spider kind of coming up on him and pounced on him and did battle with him, but the spider breathes his poisonous breath and then basically killed Tom Thumb, and you know, it’s shocking for a kid. LIO’s world is that way. Everything is kind of a shock or surreal or bizarre or scary. ANDELMAN: I have read where you have compared LIO to the character that Haley Joel Osment played in The Sixth Sense in that LIO’s world is real. I mean, that is his world, but is he the only one in his world who kind of lives and functions the way he does, surrounded by the monsters and the robots and animals and aliens? TATULLI: Yeah, I think he is the most at peace with it. In others, people just don’t see those things, you know, they are kind of walking by, or they happen to have their back turned to the situation. It’s kind of like, it’s his reality is just not acknowledged by other people. But they are there, and sometimes, it finds its way into other people’s worlds, too, but for the most part, we go on with our adult lives not seeing the things that kids are just deathly afraid of. ANDELMAN: And you know, I apologize for even asking you to go behind the scenes and talk about some of these things, because I know, if you talk to a comedian, the last thing a comedian wants to do is dissect a joke, but LIO is still so new to so many people, and we haven’t had it for years and years yet, so it helps, I think, to explain a little bit. How do you keep it fresh day after day, and how long have you been doing it now? TATULLI: Well, let’s see. It launched in newspapers last May, that would be May 2006. I originally pitched the strip to my syndicate in May 2005, so since May 2005, I have been basically writing and drawing, so like I said, it didn’t hit papers until last May, but the time between when I pitched it and when it actually hit the papers, I had to do a lot of writing and drawing, find out how I actually wanted to draw it and how I wanted the tone to be. So I have been drawing it I would say, honestly, almost two years. ANDELMAN: It is still exciting to wake up to, or is it becoming work? TATULLI: Oh no, it’s great only because, I would say mostly because there are no rules, and so every day, I can do something different, I can take it to a new place. It is always a surprise to me, and it’s an amazing, amazing thing to have a job as a syndicated cartoonist. I couldn’t be happier, I will tell you. I don’t know what I would do with myself if I weren’t doing this. ANDELMAN: Now, you have done other things, right? ANDELMAN: What else have you done besides Heart of the City? TATULLI: I started working in the film business when I was 19. I worked in every aspect of production. I did shooting, I did directing, I did editing, and then film segued into video, and then I made my way into 3-D animation and that kind of stuff and doing graphic commercials and television shows, and I also was a post-producer for a bunch of different reality television shows. But always on the side, I did comics. ANDELMAN: So, it’s interesting that a lot of comic strip artists, I mean, they start doing it from their early twenties, and they haven’t really done much of anything else, and you are coming at it a little bit differently. You have worked in these other media. You have that exposure and that familiarity. TATULLI: Yeah, I would say the majority of cartoonists that are syndicated have other things to do or still do. I would say that once they get lucky and come out of the chute with a syndicated comic, I would say that is the exception rather than the rule. 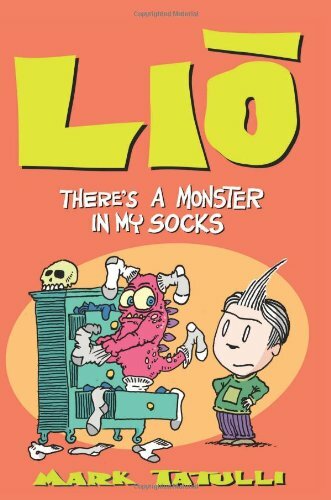 Order ‘Lio: There’s a Monster in My Socks’ by Mark Tatulli, available from Amazon.com by clicking on the book cover above! ANDELMAN: Do you have children? ANDELMAN: You do. What do you have? TATULLI: I have three kids. Their ages are, my oldest is seventeen, my middle child, daughter, is fifteen, and my youngest is twelve, soon to be thirteen. ANDELMAN: An endless source of inspiration, I guess. TATULLI: Yeah, well, they’re not as weird as I am, though. ANDELMAN: How do they respond, because this is such a different strip from Heart of the City? How did they respond when they first started seeing LIO? Were they surprised what was coming out of Dad’s mind? TATULLI: Oh, no, they know I am bizarre. They were wondering what took so long. This is just a side of my personality that just never made it into Heart of the City. I mean, sometimes it did, and you will still see samples of it in Heart of the City, but Heart of the City is a completely different strip from this, which is the only way I can do two comic strips, because I sit down and I write Heart, and it’s in a completely different way, and then when I sit down and write LIO, it’s like I have turned the switch completely 180 degrees the other direction, and that’s the only way I could do it. I’m telling you, I couldn’t do two strip-driven comics, because I think that the dialogue would just be too similar. ANDELMAN: How many papers is Heart in? TATULLI: Heart is in about a hundred papers. ANDELMAN: Okay. Now, were you able to make a living off of Heart before you started LIO? And now that you have the two strips, Heart’s in a hundred, LIO is in about two-fifty or so, is it safe to assume you are making your living off this full-time now? TATULLI: Yes. Yes, that’s what I do full-time, comic-stripping. I never bathe, I wear the same clothes all the time, all I do is draw, draw, draw. ANDELMAN: Have you gotten to the point where you have had to bring on an assistant to help with this? TATULLI: No. I couldn’t imagine somebody working for me. I can barely stand it. I think that, oh yeah, I might be better if I pull somebody in to do inking on or something like that, but then I realize, I am such a control freak, which is the whole reason I do comics for a living, I have complete control over these people’s worlds, and they don’t complain. But I think that I would end up putting just as much work in standing over somebody’s shoulder while they do it, so I don’t think that’s a good idea. And I love it. I love it. ANDELMAN: What do you think it is that was so different about Heart and LIO? I mean, Heart, a hundred papers is respectable, but as you say, you can’t earn a full-time living from that, and then LIO comes along, and inside of a year, I mean, it’s just exploded. What do you think that you learned from doing Heart, or why did one explode and one is just more of a modest….? TATULLI: I don’t know. That’s the great unknown. I mean, if we knew that, we could all do it. You could sit down and do it, and the guy across the street could do it. I mean, you just don’t know. What you have to do is just be truthful to yourself and write what you know, you heard it a million times, and you throw it out there and hope it works. You can’t over-think this stuff too much, or you can’t say, ‘Oh, well, what does the market need?’ because it doesn’t work. That always fails. Well, maybe not always, but you know, it’s really, really difficult in the comic strip business to streamline a comic strip to what you think the market wants. What I wanted to do, like I said, was sit down and bring something that I felt was different to the comics pages, something we haven’t seen in a while with a pantomime strip and something with a little bit of a darker edge. Pantomime strips are generally really, really soft, conservative gags, and this one is not that, and so I just thought it would be different. 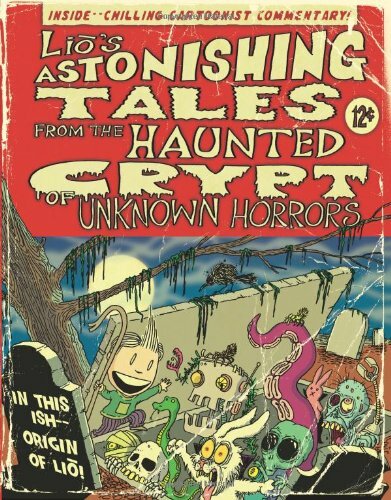 Order ‘Lio’s Astonishing Tales: From the Haunted Crypt of Unknown Horrors’ by Mark Tatulli, available from Amazon.com by clicking on the book cover above! ANDELMAN: Now, two of my favorite LIOs to date, I think they were both Sundays, one was the appearance by the boys from The Boondocks, “There goes the neighborhood,” where LIO’s family, the moving truck backs up…. ANDELMAN: ”There goes the ‘hood,” I’m sorry. Thank you. And then the one, you will have to help me with this, because I don’t have a stack of them in front of me, but it was also a Sunday strip, and I think LIO was using a spy scope to like peek into another strip. Was that the one that was turned sideways? TATULLI: Yeah. Actually, I do occasionally draw a Sunday sideways, another little quirkiness to LIO, only because I get in my mind this vision of somebody in their house having to turn their entire comics page sideways, and it gives me like a feeling of power. I just feel that the layout, some strips lay out better that way, and why not? ANDELMAN: And the moving truck. I think, anyway, you tell me if I’m wrong, it seems like you are definitely one of the artists who has benefited from The Boondocks taking either semi- or permanent retirement. ANDELMAN: And Foxtrot, right, going from seven days to one. Did you hear anything from anyone in the business about The Boondocks showing up? It was just so spot-on. TATULLI: No. Aaron McGruder is off doing his Hollywood thing. I don’t think he talks to anybody. I think he is just totally wrapped up in doing his show, so I doubt that he even saw it. I mean, somebody may have shown it to him, but you know, I didn’t hear anything from him. Like I said, that’s a whole other world, that Hollywood thing, and it’s very, very consuming, so…. ANDELMAN: Leaving the footprints, right. TATULLI: He had made his way over to LIO, and LIO packed him up in a box and was shipping him off to the home for wayward boys. And he wrote to me. ANDELMAN: Two other more modern strips, Get Fuzzy, and Pearls Before Swine, frequently break that wall crossing into other strips. Is there a danger at any point of there being too much of that? I never get tired of it. TATULLI: Yes, I agree with you. Yes, it can be overdone, and I have been kind of stepping back from that a little bit. First of all, it’s not a bottomless pit. You can only do so many comic strips, and you can’t do comic strips that are unknown to the general public, so there is like a handful of comic strips that you can rip on, but yes, I try not to go to the well too often. ANDELMAN: Patrick McDonnell, for a biography of Will Eisner two or three years ago, and he was telling me that his Sunday strip is pretty much always a tip o’ the hat to some artist or some other strip but not in the same way that you and …..
TATULLI: Yeah. He has what they call a throwaway panel that they use as a space filler, and he always gives a nod to some artist, not necessarily always a comic strip artist, but of some artist in that first panel where you would see the panel Mutts. 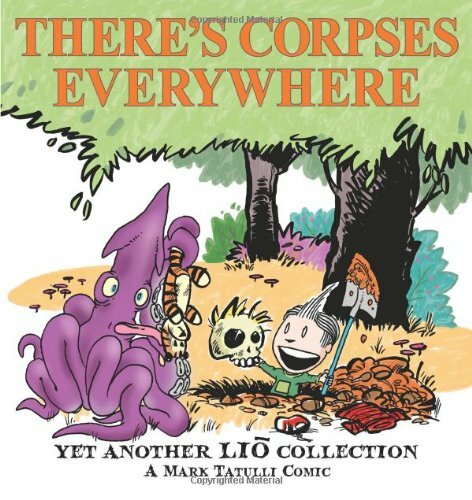 Order ‘Theres Corpses Everywhere: Yet Another Lio Collection’ by Mark Tatulli, available from Amazon.com by clicking on the book cover above! TATULLI: That’s more of an homage. ANDELMAN: How do you feel about, I have heard this from several artists over the years, and it’s no big secret that there is a younger generation of artists that is not real happy about how some of these older strips are being kept alive on life support, and they keep eating up space on these newspaper pages that continues to shrink. Do you have any thoughts on that yourself as someone who has two strips and one particularly on the rise? TATULLI: Ummm, how do I feel about, you mean, dead cartoonists’ strips? TATULLI: Well, you know, if they want to quit, that’s okay with me. As long as the reading public wants to see it, what are you going to do? I mean, syndication is a business, and as long as the newspapers are willing to pay for them, there is not much you can do about it, and if the reading public wants to see them, what are you going to do? I mean, I wouldn’t pass on my comics to anybody, because I don’t think that anybody can do it. They are not those kinds of strips. They are very, very much mired in my personality, so I don’t think… I mean, they could do it, but I don’t think it would be the same thing, but you know, like I said, syndication is a business, and as long as the newspapers are willing to pay for it and the readers want to read the older strips, then that’s just the way it is. You know, you find a way around it, and that’s, I think, giving newspaper something they want to print more. TATULLI: It’s been moot. What’s the point of complaining about it? First of all, nobody listens to cartoonists anyway. We can rip on them in our own strips, and people will agree with us and so forth, but that’s about all you can do. I mean, newspaper editors are going to do what they want, and the syndicates are going to continue to syndicate dead cartoonists’ strips and repeat strips. ANDELMAN: Right, but I mean, the way I look at it, anyway, there’s this generation in the last, oh, I don’t know, five years, let’s say, there’s LIO, Pearls, Get Fuzzy — Mutts goes back a little further. Some of these strips, they are as revolutionary in some ways as Far Side and Calvin and Hobbes were at a period of time, but there really hadn’t been much in between that made you say, “Oh, I gotta just push all this out of the way and take up this new stuff.” But now, it seems like there has been some really fresh work being done. TATULLI: Yeah, I agree, and I think that Pearls Before Swine is certainly an example of that and other strips that… And they are doing well. The new strips are doing well. It’s slow, but sure, that’s just… The fact that I have gotten 250 newspapers so quickly is just really an oddity within the business. It’s luck, it’s timing, it’s having a decent strip, the fact that two major players quit, and you have to give a tip of the hat to Bill Amend. I mean, he could have run repeats. He could have said, “Let’s go back to start with Foxtrot,” and newspapers would have bought it, and I am not saying that all the newspapers would have run it, but certainly a large amount of his list would have stayed, but he didn’t want to do that. I certainly benefited from that. I think he is to be commended for that. 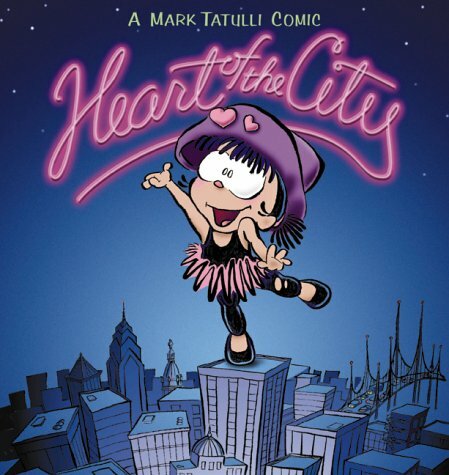 Order ‘Heart Of The City’ by Mark Tatulli, available from Amazon.com by clicking on the book cover above! ANDELMAN: Now, some of the guys who created some of the bigger strips of the last twenty years, The Far Side and Calvin and Hobbes and Doonesbury, I mean, they have struggled with a couple of things over time. They struggled with the demand to be fresh all the time, and they have taken sabbaticals and ultimately, in the case of Watterson and Larson, have given up entirely, Trudeau always every so often takes a long sabbatical, and then they have also dealt with the demands to commercialize their products, which Trudeau’s has probably given in a little more on than the other two, you seem to be on this arc, this upward swing. Have you thought, as things, opportunities might come along, what you are willing to do and what you are not with LIO? TATULLI: Oh… I just want to turn the best possible strip that I can. I am worried about building my list and maintaining it. ANDELMAN: I did see where you were asked, I guess in a syndicate interview, about how you would feel about maybe LIO translating to like an animated series, and you have that film and video experience, so I would almost guess it would be almost disingenuous for you to say it hadn’t crossed your mind. TATULLI: Oh, I mean, it crossed my mind, but that was not how I designed the strip. Aaron McGruder will tell you that when he designed his strip, it was always with animation in mind. That was his ultimate goal. My goal is to do a comic strip, and if it can segue into television or movies or whatever or Internet pieces or cell phone animations, that’s fine. I will cross that bridge when I come to it, but that was not how this strip was designed. It was designed to be just a strip, but that’s not to say I wouldn’t consider anything that came down the pike. That’s still not where my head is right now. ANDELMAN: And last question, when we will see the first collection of LIO? TATULLI: I am working on the book cover right now, and that’s due at the end of January. I really have to sit down and do that. The first collection probably won’t be out until October of this year. ANDELMAN: Oh, great. Do you have a title? TATULLI: Or maybe the end of the summer, I am not sure. Tentatively, I do have a title. It’s called LIO Stage One: Happiness is a Squishy Cephalopod. I have to figure out a cover. A cephalopod, of course, is an octopus or a squid or any other many-legged sea creature. ANDELMAN: A creature that frequently appears in the strip. TATULLI: That, of course, is a play on the best-selling book by Charles Schultz, called Happiness is a Warm Puppy. ANDELMAN: I’m sorry, I lied. I have one last question. Why is the character’s name spelled L-I-O? It always seems to be in upper case, as well. TATULLI: I just like the name Leo. I wanted something short and sweet and just clean because that’s the nature of the strip. There is no dialogue, so I didn’t want to have a clunky name. It just was a short name. I got the name Leo from a couple of different sources, actually. One of the creators of the atomic weapon, one of the inventors was named Leo, and actually, there is this… Have you heard of cartoonist Edward Gorey? TATULLI: He had this thing called “The Gashlycrumb Tinies,” like a poem. ANDELMAN: I don’t know that. TATULLI: Okay. Well, it will go through the alphabet, and he says, “‘A’ is for Amy, who fell down the stairs, ‘B’ is for Basil, assaulted by bears, ‘C’ is for Carla, who wasted away, ‘D’ is for Desmond, thrown out of the sleigh,” and it just shows these illustrations of kids being killed a whole bunch of different ways. But there is “‘L’ is for Leo” in here, it’s “’L’ is for Leo, who swallowed some tacks,’ and that cinched it for me. If Edward Gorey can use Leo, so can I, but I chose a different spelling only because I think it sets it apart, and it has almost like a foreign look to it. And the whole concept is pretty foreign to comics pages. ANDELMAN: It’s very European in a lot of ways. TATULLI: Well, yeah, it’s odd. ANDELMAN: Yeah, okay, it’s odd. TATULLI: Definitely odd. I try not to be Zippy the Pinhead odd, because I think that that is over the top, but I am sure there are a number of strips that strike people as being over the top. ANDELMAN: I just want it on record that I said European and you said odd. That’s all. I don’t want to be blamed for odd or suggesting that Europeans are odd. 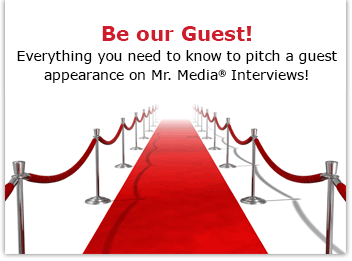 Mark Tatulli, thank you so much for participating in this Mr. Media interview. We appreciate your time and look forward to many, many years of great LIO strips. TATULLI: Oh, well, thank you very much. I hope so, too. 250 newspapers, and none has written about! and you did it very well! Just a footnote re Ferd’nand. Mik was my father and the strip, which began in Denmark, was actually published in the United States after 1948.